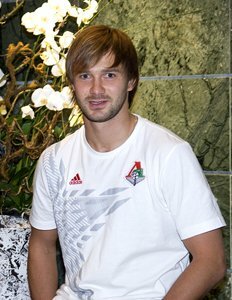 I spoke with this talented player who has been described as the ‘most exciting young Russian player since Vladimir Beschastnykh’, and found him to be a modest young man with a pleasant smile. Born in Omsk, Dmitry Sychev comes from a sporting family, his mother a track and field athlete and his father a football player and later trainer. 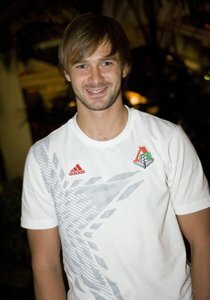 It is perhaps not surprising, then, that Dmitry was destined to become a football star himself, though he combined this passion with ice hockey until the age of ten, when he made the decision to specialise in football. It would turn out to be a good choice, for after debuting with Spartak Tambov he was signed by Spartak Moscow, before moving to Olympique Marseille in France and, since 2004, back to Russia with Lokomotive Moscow. I met up with him after his team’s training session in the Marbella sun. Q Is this your first time in Spain? No, I’ve been here many times, both with Olympique and the Russian teams. I love the climate, though I never made it here just for a holiday, but always for matches or training camps, like now. Many of my friends live here or own a property here, and seeing that it’s –20 degrees in Moscow now and around 20 degrees in Marbella, I can see why. Maybe I’ll join them sometime. Q You had a spell in France with Olympique Marseille. Would you like to play overseas again? I was with Olympique for a year and have been back in Russia with Lokomotive for six years now. I think it is a natural ambition for a footballer to want to play overseas, especially in England or Spain. Q Which Spanish club do you like best? Real Madrid and Barcelona are both very special, although they are very different to one another in terms of style, ambience and what they stand for. This club rivalry is also part of what makes the Spanish league so interesting. Q Who was your idol as a young player? As a child Pele was my absolute favourite. I used to read up a lot about him and my father would tell me about how Pele would take the world’s best teams on. He was amazingly skilled and also seemed a very good role model. Q Has it been hard to accept the disappointment of elimination from the World Cup in the play-offs? It was really painful and hard to accept. Eventually you get over it because there’s nothing else you can do, but in a football player’s career these are real low-points. It was our dream to play in the World Cup and going out in the play-offs felt like a real failure. We’re going to have to be resilient as a team and channel our disappointment into renewed determination. Q Where will you be this summer? I don’t know yet (sad smile), but I think it would be good to get away and disconnect. Maybe somewhere like Bali. Q Who do you think will win? Q What do you do when you have free time? I have many interests but not enough time. I do love surfing. I don’t like famous brands like DG, Versace etc, which are so popular in Russia now. I prefer more classic brands. I recently bought some Briony suits, for example. Maybe I’m just getting old but that’s the style I like. I have two, Hublot and Breguet. My favourite cars are the Bentley GT Continental and the Porsche 911 turbo – which is why I own them (he adds with a laugh). I like to discover new places and travel to new destinations instead of visiting the same spot over and over, so it’s hard to say which is my favourite. Also because there are things of interest and beauty in most places I go to. If you had to go to a tropical island for a month, what would you take? This entry was posted on Wednesday, August 25th, 2010 at 11:06 am	and is filed under Interviews, Sports. You can follow any responses to this entry through the RSS 2.0 feed. Both comments and pings are currently closed.